The NFL was exciting and likable for about two minutes in Pittsburgh this evening, so naturally, someone had to ruin the fun. Getting the ball down five with just over two minutes to play, Tom Brady and Rob Gronkowski combined for a vintage comeback drive that gave the Pats a 27-24 lead. However, a ridiculous run after the catch from JuJu Smith-Schuster suddenly revived Steeler hopes. On the ensuing play, a 10-yard pass from Ben Roethlisberger to Jesse James was initially called a touchdown, which probably would have won the game for the Steelers. However, a lengthy review led officials to determine that James didn’t have control as he hit the ground at the goal line. Slow-mo replaying touchdowns to look for any imperfection or movement of the ball as a receiver makes a great play is counterintuitive, boring, and unfair. And instead of enjoying an amazing back-and-forth climax to the biggest game of the week, we’re stuck trying to wrap our heads around an impenetrable rule. Two plays later, Ben Roethlisberger threw an interception, and the Patriots clinched their win. 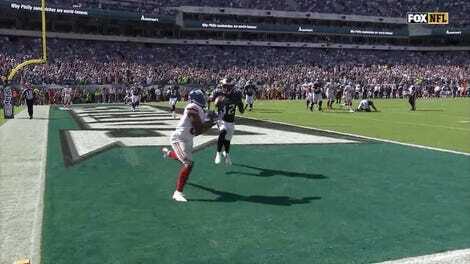 Why Wasn&apos;t Sterling Shepard&apos;s Catch Ruled A Catch?